Yes! Adidas wants your old sports shoes of any brand. 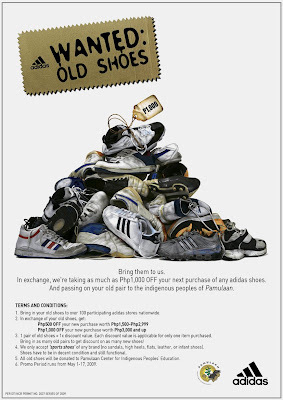 Just bring your old shoes to over 100 participating Adidas stores nationwide. In exchange, they'll be taking as much as PhP 1,000 OFF on your next purchase of any Adidas shoes. Your old pairs will be going to the peoples of PAMULAAN Center for Indigenous Peoples Education. Getting a new pair of shoes never felt this good. You have your new pair, you get BIG discount, and at the same time helping other people.